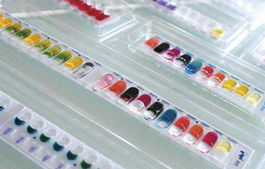 The choice of microbiologists worldwide for its ease-of-use and high-performance, the API® ID strip range is the global reference for identification. Right from the moment it launched, API® completely revolutionized the field of bacteriology. API® brings together high quality and ease of use with standardized, miniaturized strips of biochemical tests to use with comprehensive identification databases. With API®, bacterial and fungal identification is simple, rapid and reliable. That’s why today, API® is recognized as THE REFERENCE for identification of bacterial and fungal species. With multiple biochemical reactions in limited wells along with a wide identification database on the market, API® makes bacterial identification reliable and accurate. Simplify the interpretation of your API® strip result. As innovative today as when API® was first developed, bioMérieux gives a new dimension to this range by making identification simple and available to everyone, anytime, and anywhere. apiweb™ leverages advanced technology to be the essential complement to manual identification. Please contact your local bioMérieux representative for product availability. Geiss HK, Piotrowski HD, Hingst V.
Ieven M, Verhoeven J, Pattyn SR, Goossens H.